I am a full professor in the School of Mathematical Sciences of Tel Aviv University. My research interests are in Probability Theory, Statistical Physics and related fields. Delocalization of uniform graph homomorphisms from Z2 to Z. Joint with Nishant Chandgotia, Scott Sheffield and Martin Tassy. Preprint. Longest increasing path within the critical strip. Joint with Partha Dey and Mathew Joseph. Preprint. A power-law upper bound on the correlations in the 2D random field Ising model. Joint with Michael Aizenman. To appear in the Communications in Mathematical Physics. Rigidity of proper colorings of Zd. Joint with Yinon Spinka. Preprint. Appendix in On locally repeated values of arithmetic functions over Fq[T] by Ze'ev Rudnick. The Quarterly Journal of Mathematics (2018). A condition for long-range order in discrete spin systems with application to the antiferromagnetic Potts model. Joint with Yinon Spinka. Preprint. Limit distributions for Euclidean random permutations. Joint with Dor Elboim. To appear in the Communications in Mathematical Physics. The Fröhlich-Spencer Proof of the Berezinskii-Kosterlitz-Thouless Transition. Joint with Vital Kharash. Preprint. 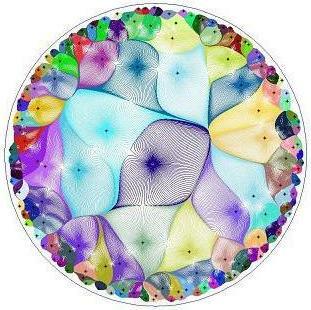 Rarity of extremal edges in random surfaces and other theoretical applications of cluster algorithms. Joint with Omri Cohen-Alloro. To appear in the Annals of Applied Probability. Lectures on the spin and loop O(n) models. Joint with Yinon Spinka. To appear in Sojourns in Probability and Statistical Physics, celebrating Charles Newman's 70th birthday. Macroscopic loops in the loop O(n) model at Nienhuis' critical point. Joint with Hugo Duminil-Copin, Alexander Glazman and Yinon Spinka. Preprint. On the Wegner orbital model. Joint with Jeffrey Schenker, Mira Shamis and Sasha Sodin. International Mathematics Research Notices 2019(4), pp.1030-1058. Hole probability for zeroes of Gaussian Taylor series with finite radii of convergence. Joint with Jeremiah Buckley, Alon Nishry and Mikhail Sodin. Probability Theory and Related Fields 171, no. 1-2 (2018): 377-430. On the Cycle Structure of Mallows Permutations. Joint with Alexey Gladkich. Annals of Probability 46 (2018), no. 2, 1114-1169. Matrix regularizing effects of Gaussian perturbations. Joint with Michael Aizenman, Jeffrey Schenker, Mira Shamis and Sasha Sodin. Communications in Contemporary Mathematics 19 (2017), no. 3, 1750028, 22pp. On the trace of random walks on random graphs. Joint with Alan Frieze, Michael Krivelevich and Peleg Michaeli. Proceedings of the London Mathematical Society 116 (2018), no. 4, 847-877. Chebyshev-type Quadratures for Doubling Weights. Joint with Shoni Gilboa. Constructive Approximation 45 (2017), no. 2, 193-216. Random Dirichlet series arising from records. Joint with Yuval Peres, Jim Pitman and Ryokichi Tanaka. Journal of the Mathematical Society of Japan 67.4 (2015): 1705-1723. Exponential decay of loop lengths in the loop O(n) model with large n. Joint with Hugo Duminil-Copin, Wojciech Samotij and Yinon Spinka. Communications in Mathematical Physics 349 (2017), no. 3, 777-817. Double roots of random Littlewood polynomials. Joint with Arnab Sen and Ofer Zeitouni. Israel Journal of Mathematics 213.1 (2016): 55-77. Bijective combinatorial proof of the commutation of transfer matrices in the dense O(1) loop model. Joint with Dan Romik. Séminaire Lotharingien de Combinatoire 73 (2015): B73b. A differential version of the Chebyshev-Markov-Stieltjes inequalities. Joint with Shoni Gilboa. Journal of Approximation Theory 196 (2015), 13-54. Delocalization of two-dimensional random surfaces with hard-core constraints. Joint with Piotr Miło&sacute;. Communications in Mathematical Physics 340.1 (2015): 1-46. Separating signal from noise. Joint with Nir Lev and Yuval Peres. Proceedings of the London Mathematical Society 110 (2015), no. 4, 883-931. Random Walk with Long-Range Constraints. Joint with Yinon Spinka. Electronic Journal of Probability 19 (2014), no. 52, 1-54. Rigidity of 3-colorings of the discrete torus. Joint with Ohad N. Feldheim. Annales de l'Institut Henri Poincaré Probabilités et Statistiques, vol. 54, no. 2, pp. 952-994. Institut Henri Poincaré, 2018. Lengths of Monotone Subsequences in a Mallows Permutation. Joint with Nayantara Bhatnagar. Probability Theory and Related Fields 161 (2015), no. 3-4, 719-780. Grounded Lipschitz functions on trees are typically flat. Joint with Wojciech Samotij and Amir Yehudayoff. Electronic Communications in Probability 18 (2013), no. 55, 1-9. Probabilistic existence of regular combinatorial structures. Joint with Greg Kuperberg and Shachar Lovett. Geometric And Functional Analysis 27 (2017), no. 4, 919-972. Extended abstract version appeared in STOC 2012. Lipschitz Functions on Expanders are Typically Flat. Joint with Wojciech Samotij and Amir Yehudayoff. Combinatorics, Probability and Computing 22 (2013), no. 4, 566-591. A recursive construction of t-wise uniform permutations. Joint with Hilary Finucane and Yariv Yaari. Random Structures and Algorithms 46 (2015), no. 3, 531–540. Odd Cutsets and the Hard-core Model on Z^d. Joint with Wojciech Samotij. Annales de l'Institut Henri Poincaré Probabilités et Statistiques 50 (2014), no. 3, 975-998. High-Dimensional Lipschitz Functions are Typically Flat. Annals of Probability 45 (2017), no. 3, 1351--1447. Poisson Thickening. Joint with Ori Gurel-Gurevich. Israel Journal of Mathematics 196 (2013), 215-234. Stationary Map Coloring. Joint with Omer Angel, Itai Benjamini, Ori Gurel-Gurevich, Tom Meyerovitch. Annales de l'Institut Henri Poincaré 48, No. 2 (2012), 327-342. Gravitational Allocation to Poisson Points. Joint with Sourav Chatterjee, Yuval Peres and Dan Romik. Annals of Mathematics 172 (2010), no. 1, 617--671. Phase Transitions in Gravitational Allocation. Joint with Sourav Chatterjee, Yuval Peres and Dan Romik. Geometric And Functional Analysis 20 (2010), No. 4, 870-917. Simple Universal Bounds for Chebyshev-Type Quadratures. Journal of Approximation Theory 162 (2010), No. 12, 2317-2348. 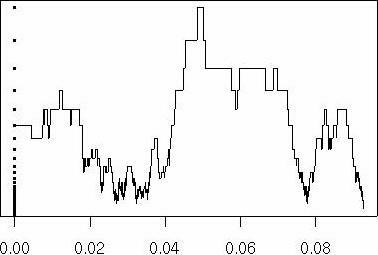 The Maximal Probability that k-wise Independent Bits are All 1. Joint with Ariel Yadin and Amir Yehudayoff. Random Structures & Algorithms 38 (2011), No. 4, 502-525. Growth of the Number of Spanning Trees of the Erdös-Rényi Giant Component. Joint with Russell Lyons and Oded Schramm. Combinatorics, Probability & Computing 17(5): 711-726 (2008). On Rough Isometries of Poisson Processes on the Line. Annals of Applied Probability, Volume 20, Number 2 (2010), 462-494. Brownian Motion on Time Scales, basic hypergeometric functions, and some continued fractions of Ramanujan. Joint with Shankar Bhamidi, Steve Evans and Peter Ralph. Probability and statistics: essays in honor of David A. Freedman, 42-75, Inst. Math. Stat. Collect., 2, Inst. Math. Statist., Beachwood, OH, 2008. On k-wise Independent Events and Percolation. Joint with Itai Benjamini and Ori-Gurel Gurevich. Extended abstract version and slideshow are available. Restoring Topology from Shifts. My master's thesis under Prof. Boris Tsirelson. Preprint. Support from the Israel Science Foundation grants 1048/11 and 861/15, the Marie Skłodowska-Curie Actions International Reintegration Grant SPTRF and the ERC Starting Grant LocalOrder is gratefully acknowledged. Presentation of a talk on roughness of the height function of square ice and long-range order in proper colorings and other models on Zd, Critical Phenomena in Statistical Mechanics and Quantum Field Theory, October 2018, PCTS Princeton. Presentation of a talk on the correlations in the 2D random-field Ising model, International Congress of Mathematical Physics, July 2018, Montreal. Lectures on the spin and loop O(n) models. Joint with Yinon Spinka. Expanded version of lectures given at the School and Workshop on Random Interacting systems, June 2016, University of Bath. Video of talk on Band Permutations, Groups, Graphs and Stochastic Processes workshop, June 2015, Banff. Lecture notes on Spatial Random Permutations for the Warsaw Summer School in Probability, June 2015, Warsaw University. 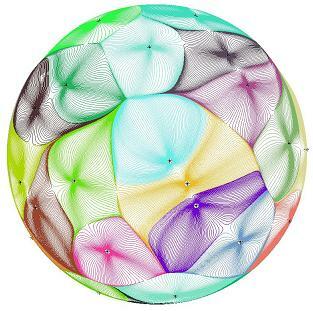 Video of talk on Delocalization of Two-Dimensional Random Surfaces with Hard-Core Constraints, Random Graphs, Random Trees and Applications workshop, March 2015, Newton Institute, Cambridge. Video of talk on Probabilistic Existence of Regular Combinatorial Structures, Midrasha Mathematica 18, January 2015, IAS Hebrew University. Presentation of a talk on gravitational allocation to Poisson points in Rd, d≥3. Post-doctoral fellows: Matan Harel (2017-), Raimundo Briceño (2016-, with Asaf Nachmias), Alexander Glazman (2016-), Alexander Magazinov (2016-2018, HSE Moscow), Xiaolin Zeng (2016-2018, Université de Strasbourg), Nishant Chandgotia (2015-2018, with Jon Aaronson, Hebrew University), Jeremiah Buckley (2013-2014, with Mikhail Sodin, King's college London), Wojciech Samotij (2012-2013, with Noga Alon and Michael Krivelevich, Tel Aviv University), Tom Ellis (2011-2012, with Boris Tsirelson, Microsoft Research Cambridge). Ph.D. students: Yinon Spinka (graduated August 2018, University of British Columbia). Master's students: Dor Elboim (graduated December 2017, Ph.D. Princeton), Vital Kharash (graduated November 2017), Omri Cohen-Alloro (graduated November 2017), Alexey Gladkich (graduated January 2016) and Yinon Spinka (graduated October 2013). I organize the Horowitz Seminar on Probability, Ergodic Theory and Dynamical Systems. Suggestions for talks (of yours or of other people) are welcome. Workshop on Strongly Correlated Random Interacting Processes, January 28 - February 3, 2018, Oberwolfach, Germany. Organized with Vladas Sidoravicius and Alexandre Stauffer. Beauty of Analysis, in honour of Mikhail Sodin's 60th birthday, January 11-12, 2018, Tel Aviv University. Organized with Lev Buhovsky and Alexander Olevskii. Elegance in probability: A conference honoring Russell Lyons' 60'th birthday, September 3-7, 2017, Tel Aviv University. Organized with Asaf Nachmias and Yuval Peres. Mini-workshop on Probability Theory, June 2-5, 2016, Dead Sea, Israel, as part of the Israel Mathematical Union meeting. Organized with Asaf Nachmias. Spring 2019: Undergraduate seminar on the coupling method following the book by Lindvall. Modern topics in probability. Horowitz Seminar. Fall 2018: Brownian motion, martingales and stochastic calculus. Horowitz Seminar. Spring 2018: Probability for Mathematicians. Horowitz Seminar. Fall 2017: Random Matrices. Horowitz Seminar. Spring 2017: Topics in Statistical Physics and Probability Theory. Probability for Mathematicians. Horowitz Seminar. Spring 2016: Introduction to Probability Theory. Probability for Mathematicians. Horowitz Seminar. Spring 2015: Graduate Seminar on Spatial Random Permutations. Guided Reading on Probability with Martingales. Horowitz Seminar. Fall 2014: Introduction to Number Theory. Introduction to Probability Theory. Horowitz Seminar. Spring 2014: Brownian Motion. Introduction to Probability Theory. Horowitz Seminar. Fall 2013: Undergraduate Seminar on the longest increasing subsequence of a random permutation following the book of Dan Romik. Horowitz Seminar. 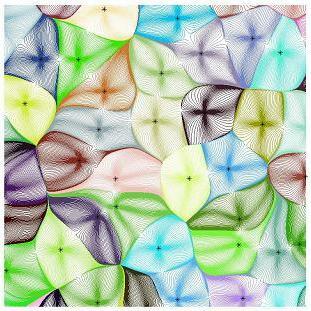 Spring 2013: Advanced Topics in Probability - Percolation. Introduction to Probability Theory. Horowitz Seminar. Fall 2012: Undergraduate Seminar on Probability on Graphs following the book of Geoffrey Grimmett. Horowitz Seminar. Spring 2012: Introduction to Probability Theory. Probability for Mathematicians. Horowitz Seminar. Fall 2011: Undergraduate Seminar on Markov Chains and Mixing Times following the book of Peres, Levin and Wilmer. Horowitz Seminar. Spring 2011: Random Walks and Brownian Motion. Horowitz Seminar. Fall 2010: Introduction to Probability Theory. Horowitz Seminar. Spring 2010: Calculus II (V63.0122) at NYU. Fall 2009: Discrete Mathematics (V63.0120) at NYU. Spring 2009: Combinatorics (V63.0240) at NYU. Previously I had been a teaching assistant for the courses Stat 2 (Introduction to Statistics) and Stat 134 (Concepts of Probability) at UC Berkeley and for the courses Linear Algebra, Calculus and Ordinary Differential Equations for engineers at Tel Aviv University. Below are pictures from some of the projects that I have worked on. Click on some of the pictures for more information and related pictures. Second row: The potential for the allocations to the planar and hyperbolic Gaussian Analytic Functions. 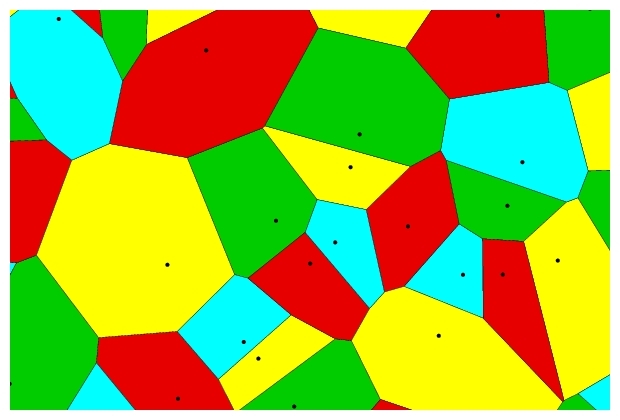 4 coloring of Poisson-Voronoi map. Michael Aizenman, Omer Angel, Itai Benjamini, Shankar Bhamidi, Nayantara Bhatnagar, Jeremiah Buckley, Nishant Chandgotia, Sourav Chatterjee, Omri Cohen-Alloro, Partha Dey, Hugo Duminil-Copin, Dor Elboim, Steve Evans, Ohad N. Feldheim, Hilary Finucane, Alan Frieze, Shoni Gilboa, Alexey Gladkich, Alexander Glazman, Ori Gurel-Gurevich, Mathew Joseph, Vital Kharash, Michael Krivelevich, Greg Kuperberg, Nir Lev, Shachar Lovett, Russell Lyons, Tom Meyerovitch, Peleg Michaeli, Piotr Miło&sacute;, Alon Nishry, Yuval Peres, Jim Pitman, Peter Ralph, Dan Romik, Ze'ev Rudnick,Wojciech Samotij, Oded Schramm, Jeffrey Schenker, Arnab Sen, Mira Shamis, Scott Sheffield, Mikhail Sodin, Sasha Sodin, Yinon Spinka, Ryokichi Tanaka, Martin Tassy, Yariv Yaari, Ariel Yadin, Amir Yehudayoff, Ofer Zeitouni.